After the string of poor results led Mihajlovic to the desperation move of a ritiro this week, it was difficult to predict how the team would react. And the ritiro was meant to be indefinite, too, not just up until the Juve match but at least through the Juve match, depending on their performance. Whether the players were just scared to death of so much Mihajlovic, missed their families too much, were sick of each other, or simply thought their teammates just smelled too much, the reaction was clear in the performance tonight. They wanted this ritiro to be over. And even if the result was disappointing, they showed the world how to lose like a winner. Obvious result aside, this was a great game. Milan came to play, and there were just so many great moments. Like Alex introducing himself to Mandzukic in the second minute, with the result being a bloody nose for the Croatian. Or in the eighth minute when a cross/shot/something from Abate woke Buffon up at the near post and gave the video techs an excuse to demonstrate GLT (Goal Line Technology,) and not for the only time in this match. It must be said that Buffon had one of the games of his life in this match. I’m sure he felt responsible to teach the young Donnarumma by example. But I’m also pretty sure his girlfriend found soiled pants when he got home, because he looked scared early and often. Like when he produced a massive double save on Balotelli’s free kick and the rebound in the 14th. Or when Alex’s missile launched header from Balotelli’s corner kick screamed past him in the 18th. 1-0 Milan. If only this result could have lasted, it was so perfect to go up on such a great goal so early on. And to score from yet another corner, Milan have scored eight corners, the most corners in Serie A this season. I must give a shoutout to Daniele Orsato here, as he did a fantastic job reffing this match. Despite giving seven yellow cards, he was firm and fair and kept a game together that often sees one or more players sent off. 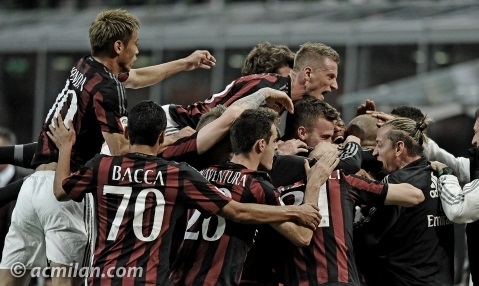 (But Mexes was on the bench, so it worked out.) He did not pander to the diving and whining of some Juve players (looking at you Cuadrado and Pogba.) More importantly, he is one of the only refs I’ve ever seen treat Balotelli like any other player and call the fouls and give the cards when necessary. I don’t know if he didn’t get the hate memo or just feared my tongue lashing postmatch here or what, but he is to be commended. Well done. Donnarumma tipped a dangerous Marchisio shot over in the 25th, but was not so lucky in the 27th. Buffon came well out of his area, most of the way to the half, and then sent a ball forward that ended with Mandzukic scoring the equalizer. 1-1 But Milan didn’t cower or fold. They fought hard through to the half, and came back fighting even harder in the second half. The 51st was heartbreaking comedy gold, when Bacca’s shot was parried, then Balotelli’s rebound initially saved, but as the ball bounced around, Barzagli did his best to make an own goal. However Balotelli, now the transformed man, would not allow that to happen, so he shoved the ball into the back of the net alongside Barzagli like he was dunking a basketball or spiking a volleyball or something. And then he took the yellow card for the handball, too. Such a gentleman. But he made up for it a minute later with a near lethal strike that went just over. So unlucky. In the 59th, Alex finally got a yellow card. He had been trying so hard all game long, but all Orsato would do was whistle for fouls. And then, as the yellow cards began to flow, interspersed with increasing Juventus chances due to tired Milan legs, Pogba scored the winning goal in the 65th. From a corner. 2-1 Juventus. As much as Milan have been scoring from corners, we are conceding an increasing number from set pieces, and it is disturbing. Too bad they didn’t work on that in ritiro this week, they probably had some extra time. What happened around the 73rd is different depending on whom you ask. If you ask the level-headed, logical, don’t rock the boat kind of person, Montolivo motioned for a sub for Balotelli (apparently he can’t do that on his own?) and Mihajlovic thought Montolivo was injured and asking to be subbed. To most Milan fans, it looked like Mihajlovic was looking to sub Montolivo and Montolivo refused the sub. So pick your version. Either way, Locatelli was prepped, on the sideline, the board was up for the sub, and our “captain” spoiled his debut by refusing to come off. This was hard considering that with some tired legs out there, Montolivo looked about the most tired, and we could have most used the spark of fresh legs at that spot. Instead, Adriano came on for Honda in the 74th, then in the 77th, the inexplicable Boateng for Balotelli substitution. Which is especially bizarre, because even an exhausted Balotelli brings more to the table than a fresh Boateng. And then Mihajlovic didn’t even use the third sub. But well done, Locatelli. You made it to the touchline. Maybe when Montolivo dies, he’ll let you play a few minutes. I guess this ritiro really worked. Or perhaps they've both been taking estrogen? Milan had 11 shots with five on target, whereas Juventus had only nine with four on target. We were hungry, fearless, and not afraid to use our hands. With a bit of luck we absolutely should have tied this match, and with a bit more luck, it easily could have been a win. Certainly, Allegri is going to be thinking harder about the Coppa Italia final now, I don’t think many people expected this from Milan. And I’m not even sure that Milan expected this from Milan. But it’s good that they fought like lions, because now they can go home to their families. More importantly, they did not make a mockery of the touching coreo & video tributes to Cesare Maldini at the beginning of the match. Watching Baresi’s face light up as he watched the footage made me fear that this team would bring shame once again to the Milan crest. But they didn’t. The scoreline doesn’t do their performance justice at all. Had Cesare Maldini actually been there, he could have left the stadium with his head held high. Certainly the 75,000 or so fans who were there were treated to a great game of football. And the fact that Milan held their own against the steamroller that is Juventus of late shows that the greatness of the club the red and black play for is not gone completely. They may have lost the match, but they gained respect. And that is how to lose like a winner.